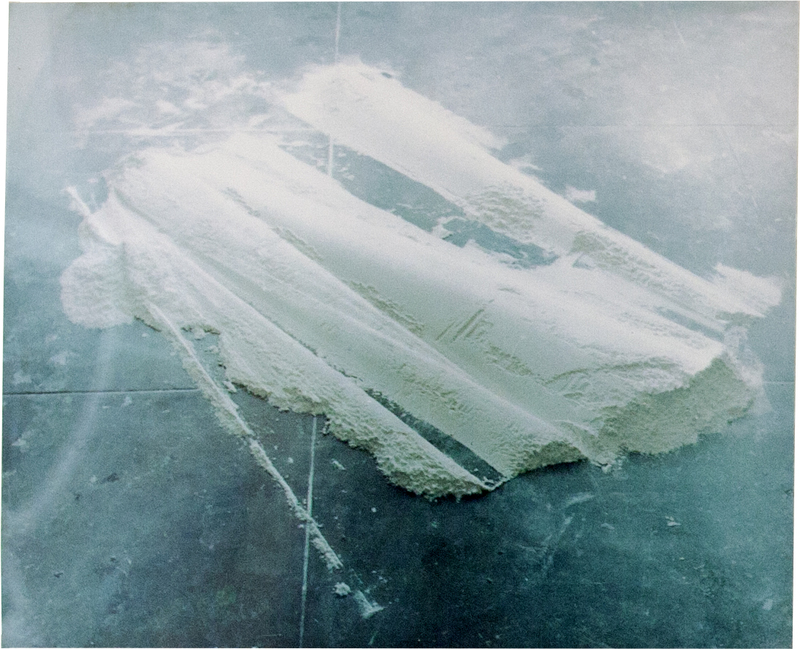 Bruce Nauman, Flour Arrangements (detail), 1966, seven colour photographs, various dimensions. When the young Bruce Nauman (*1941) took the photographs of his Flour Arrangements in 1966, it was not his ambition to produce photographically perfect images. He simply used the camera as an instrument that seemed particularly suited to his purposes. His chief interest lay in structuring his activity as an artist in his studio, and with this in mind he had set himself a very specific task: to create sculptures out of flour every day for a month. With the photos, he wanted to document the results of his work. But the prints showed an effect that went beyond documentation: they rendered their subject alien and strange. Nauman made use of this effect: by selecting seven images and presenting them as an artwork, he lent the photos a value largely independent of his original action. He recognized photography as a means of activating the viewer’s perception by disconcerting their eye—and thus, almost in passing, opened up a new function for the medium. We cannot actually infer from Flour Arrangements that it is intended as the representation of an event. The pictures on the wall show static situations of a similar appearance, slightly out of focus, with a greenish hue and at first sight enigmatic motifs, whose physical properties and dimensions are almost impossible to divine. We wonder what we are looking at: aerial shots of formations in the ocean? 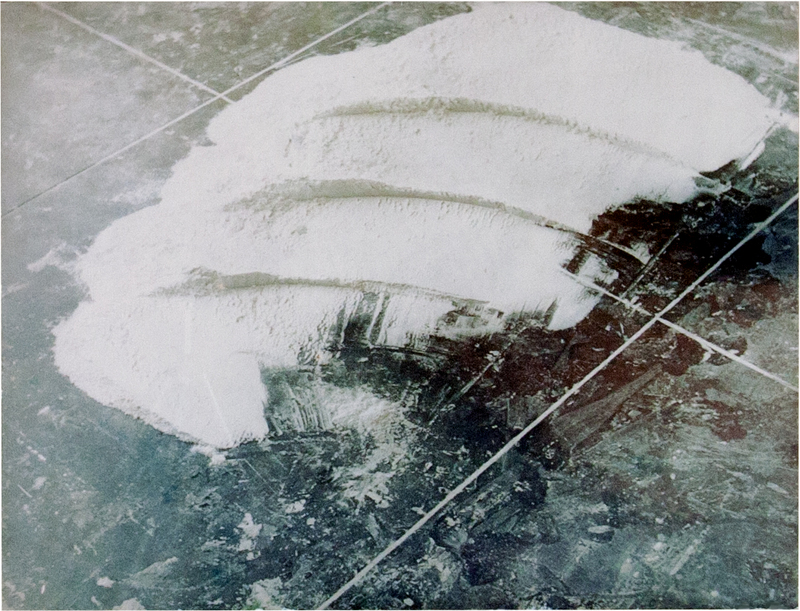 Police photos of confiscated cocaine? Only indirectly and after a delay do we learn that the cryptic white forms on the greenish ground are the results of a sculptural act in the studio. Enquiring as to the title of the work, our confusion only grows. For the answer sounds like “flower arrangements”—and these we really cannot see. After the act of photographing, Nauman used the homophones flour and flower as a further means of alienation. He invoked the idea of the familiar floral bouquet and played with the discrepancy between seeing and hearing. The matter is more complex than it first appears. It becomes increasingly apparent that Flour Arrangements encompasses more than the seven different-size photographs behind their Plexiglas covers, mounted as a group on the wall. Since the photos are evidently part of a series of operations, we find ourselves wanting to know more about the artistic concept behind them. And this, too, turns out to be unconventional. With his project, Nauman challenged himself. He put his discipline and his standards of creative ambition to the demanding test of creating, every day for a month in his emptied studio, a sculptural form out of flour; of documenting the result with his camera; and then of destroying his day’s work, in order to shape the material into a new form the following day. Flour is an unusual material for a sculptural act, since its powdery consistency defies solid form. This contradiction undoubtedly held a particular challenge for the young artist. With regard to the genesis of the idea, William T. Wiley, Nauman’s only slightly older friend and teacher at the University of California in Davis, recalls that once when Nauman visited him, he had laid out a wood grid covered with white felt that he was going to cover with flour and name Japanese Flour Arranging.3 Soon afterwards he abandoned the piece, whereupon Nauman asked if he could adopt it himself. Wiley consented. He had himself already taken inspiration from Nauman and probably knew his friend well enough to foresee that he would make something different out of the idea than the object imagined by Wiley. The impact of Nauman’s action only made itself felt, however, through its association with photography. The use of the camera as a means of documentation allowed a “fixing” of Nauman’s ephemeral sculptures and at the same time laid the foundations, with its static images, for their long-term impact. More than that: with the making of the seven-part photo sequence, a further artwork imbued with its own power of expression was created after the action itself. The translation of Nauman’s activities in the studio into another medium initiated a new art form. Bruce Nauman, Flour Arrangements, 1966, seven colour photographs, various dimensions. In 1967, in his first interview, Nauman also raised a further point: “[…] you tend to believe what is shown on a film is really true—you believe a film, or a photograph, more than a painting.”8 By this time he had already developed a scepticism towards traditional art forms and embarked on his own, independent path. He was convinced that “painting is not going to get us anywhere, and most sculpture is not going to either”.9 Painting was part of his art major at the University of Wisconsin, Madison, where from 1960 to 1964 he took classes in the sciences as well as the arts, but its importance for him subsequently declined.10 Since 1965, when he embarked on a masters at the University of California in Davis, Nauman has understood himself as a sculptor. It was at UC Davis that he began to make fragile sculptures with an organic air out of fibreglass and polyester resin, which he suspended from or leaned against the wall and for which he build clay or plaster molds. In 1965/66 he also used rubber, latex and felt and accentuated the amorphousness of his objects. In 1966, even before completing his course, Nauman had his first solo show at the Nicholas Wilder Gallery in Los Angeles,11 where he showed his new sculptures. He described them as “soft-shape forms”12—something that might also be said of his flour arrangements, if their forms as such had been his goal. As from around 1967 other artists, such as Eva Hesse and Richard Serra, likewise began employing materials that took away from sculpture its hardness and its fixed outline. 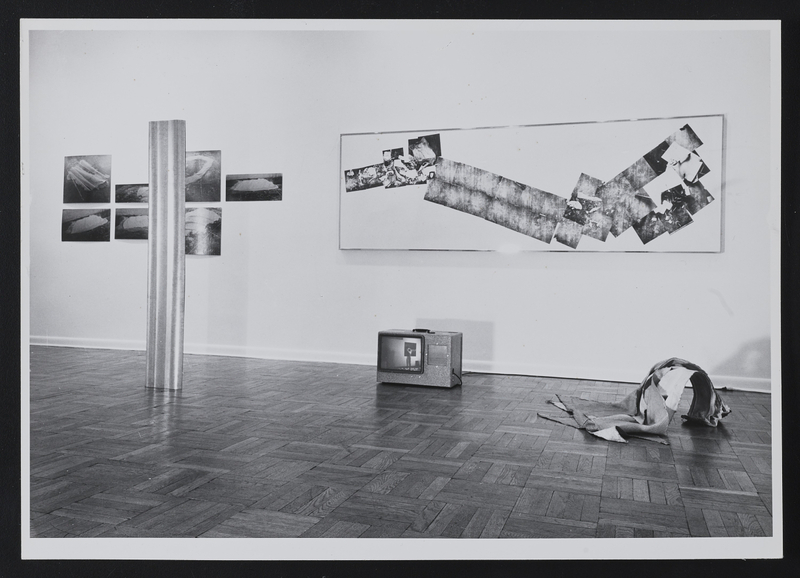 Appearing in New York at this time were manifestations of Minimal art, whose works, in most cases industrially manufactured, established a relationship to space based on the precision of form and the principle of the right angle. This development provoked both lively interest and counter-movements at an international level. Nauman showed himself little affected by it; nor was he seeking to oppose anything in particular. With a remarkable openness for effects and meanings, he pursued his own idea of art, which revolved around human behavior and avoided current forms of artistic expression and formal constrictions. For Nauman, the move to a processual practice that he made with his Flour Arrangements had the characteristics of an experiment and was just as new and unfamiliar as the use of photography as a means of transmission. Nauman, who had first studied mathematics before deciding to be an artist, sometimes set himself tasks as a sort of (mathematic) demonstration to see if an idea actually worked. Beyond its position within Nauman’s own artistic development, the Flour Arrangements stand at a turning point: at the transition from the production of sculptural objects to the performance of “actions”. These structured sequences of activity opened up entirely new dimensions and modes of working for artists.13 In contrast to Performance art, located on the border zone with dance and theatre, they generally took place without a public. Their recording and transmission were closely bound up with the availability of technical media such as photography and film, and somewhat later with the then new technique of video, whose advantages over film included its lighter and more mobile cameras. With the solitary actions in his studio, Nauman provided an example for a whole movement. He seized at an early date upon the use of his own body as material for a process-based method and recognized the importance of media as information carriers. Insofar as he subordinated his activities in the studio to certain rules and also worked parts of his body, such as his face and his thigh, with his hands as a malleable substance,14 Nauman broadened the definition of art-making, of sculpture and material in an astonishing direct manner. The innovative energy of his independent process, documented in photos and films, conveys itself even decades later. Nauman’s unconstrained handling of materials and techniques anticipates an understanding that starts not from the end product but from the activity. The product takes shape as long as the action is sufficiently logical and structured. This attitude has led to the characteristic variety of Nauman’s oeuvre, whose many manifestations allow his works to break through and renew the familiar categories of art. Paying no regard to conventions, Nauman chooses the process that seems to him most efficient for the effect he would like to achieve. Flour Arrangements is an early example of this—both as process sculpture and as resulting photo series. As a documentation of structured sequences and actions, the practice of taking photographs only became more widespread a few years later, in the wake of Conceptual art. It then quickly assumed worldwide importance and for a time overtook the traditional categories of painting and sculpture as an artistic technique. By this stage Nauman, whose ideas on the transmission of activity and movement had meanwhile evolved, had already exchanged photography for film and video, media that corresponded more closely to his aims. 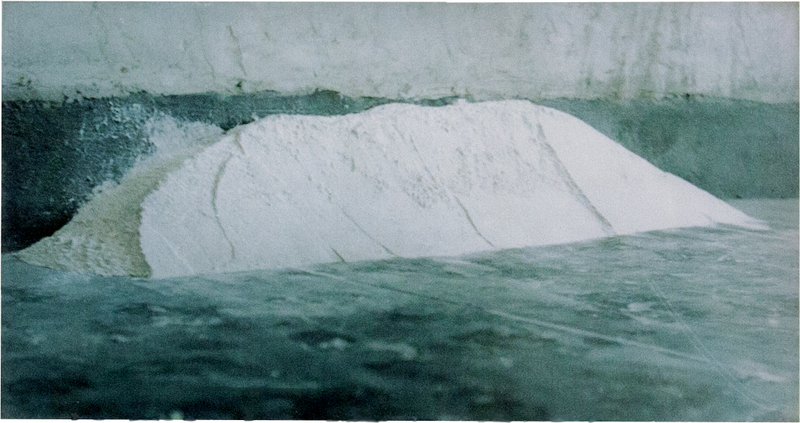 Flour Arrangements is a starting point not only for Nauman’s “linguistic” photographs, but also for the 16 mm films that he made as from 1967/68 with the aid of a fixed camera in his studio. The manner in which these films show the artist performing movements and gestures serves to convey the intensity of his systematically repeated actions to the viewer. Unlike in Andy Warhol’s early films, in which the camera was directed unchangingly for hours upon a person or an object,23 Nauman used the stationary camera to record his own body movements within a tightly framed view over a period of some ten minutes. Film duration and recording time are the same and are bound up with both the length of the roll24 and the strenuousness of Nauman’s actions and his physical stamina. With the use of the video camera as from 1968, the films are then extended in loops, often to a length of one hour. Although the seven photos of Flour Arrangements are soundless and static, the visual impact of the sequence exerts a fascination that—through the constant repetition of (never quite) the same thing—subsequently also lends tension to Nauman’s films. We find ourselves drawn into a process of perception whereby the distanced manner in which we usually view an image switches into an active following of the artist’s endeavor. Bruce Nauman, exhibition view with Flour Arrangements and Composite Photo of Two Messes on the Studio Floor, Leo Castelli Gallery, New York, January – February, 1968. 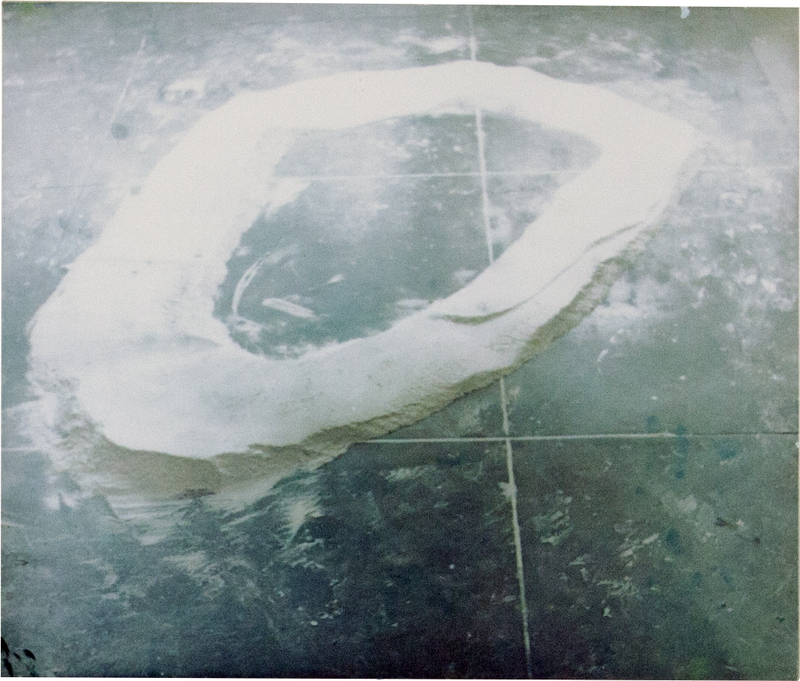 In 1967 Nauman created a photo collage in which remnants of Flour Arrangements once again make an appearance, as if in a series of film stills. The artist called the montage, which measures over three meters long and over one meter high, Composite Photo of Two Messes on the Studio Floor.25 Its visual sequence combines pictures of the vestiges of flour or dust on the floor with photos of other studio debris.26 As well as Nauman’s use of random and unpretentious materials, the collage also documents the continuity of an activity. The pictures are taken from above, whereby—as in Flour Arrangements—our distance from the motifs is hard to judge. Joan Simon writes in her catalogue raisonné of Nauman’s oeuvre that the camera angle was inspired by early satellite images.27 The use of satellites to record and survey the Earth’s surface was one of the great scientific advances of the 1960s. Nauman had always been interested in technical, political and social developments and these often became the starting point for new works. One year after creating Flour Arrangements, in October 1967 Bruce Nauman repeated the activity for a documentary film, which he made for the KQED Experimental Television Project at the instigation of fellow artists William Allan and Peter Saul.28 Thanks to this film, we can see just how much flour Nauman used, namely 50 lbs. ; that the piece of wood with which he pushed, scraped and carved the flour into its various shapes was almost man-high; and above all how laborious the whole process was. Performing the activity proves to be substantially more complex than its simple description might make it appear. Its overall scale poses a physical challenge and the act of shaping the flour involves strenuous effort. 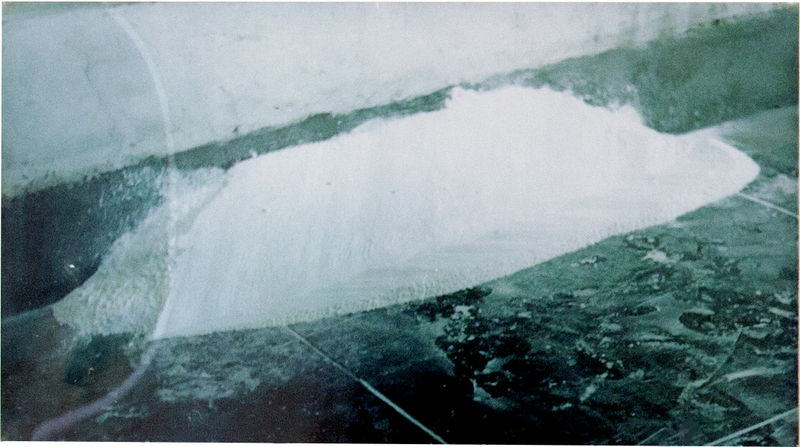 Nauman empties the paper sacks full of flour onto the studio floor and, with great concentration, embarks on getting the amorphous white heap “into shape”. The accomplishment of this sculptural process absorbs him entirely. Even if the thirty-day exercise is effectively condensed into a few hours of filming, and Nauman’s work is interrupted by the casual small talk of his friends seated smoking to one side, the film nevertheless conveys an impression of the intensity of Nauman’s self-imposed challenge. 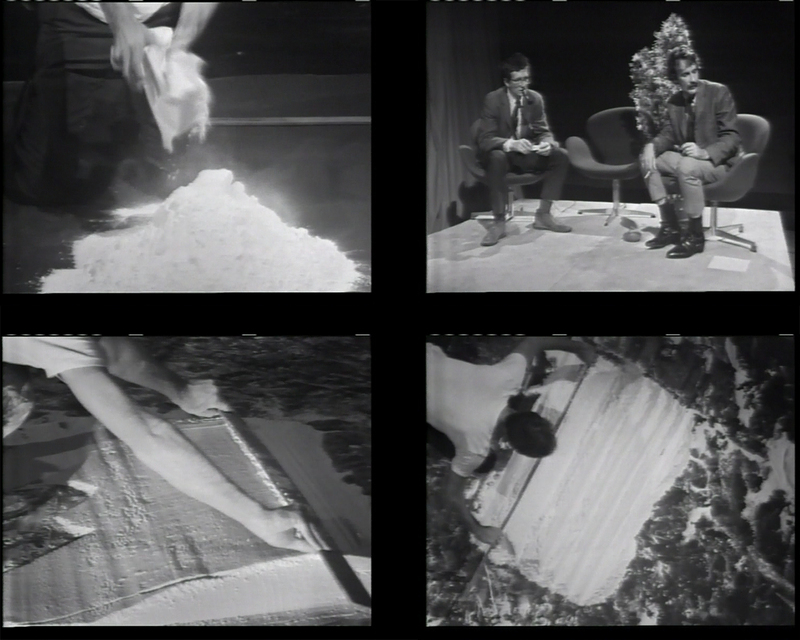 Bruce Nauman, Untitled (Flour Arrangements), with William Allen and Peter Saul for the Experimental Television Project, KQED, Channel 9, 1967 (stills), 24 min., b/w, sound, University of California, Berkeley Art Museum and Pacific Film Archive. 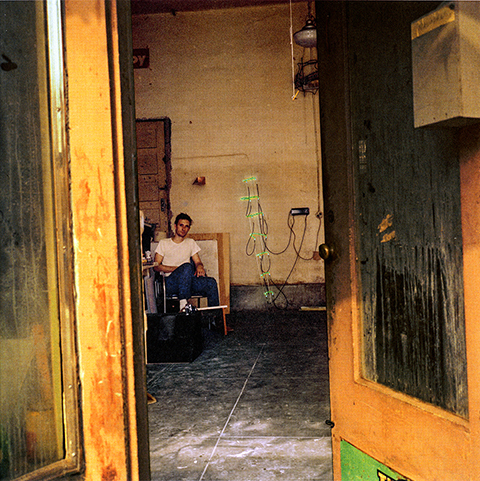 Bruce Nauman in his San Francisco studio, c. 1966. Reproduced in: Peter Plagens, Bruce Nauman: The True Artist, London, Phaidon, 2014, fig. 44, p. 53. Photo: © Jack Fulton / 2018, ProLitteris, Zurich. Hallen für Neue Kunst, Schaffhausen with Bruce Nauman, Flour Arrangements and Pair of Rhomboid Depressions. The significance of the Flour Arrangements is as complex as the entire action that underlies them. The artwork marks the transition from art object to an understanding of art as process. Almost in passing, it opened up unexpected visual effects for photography with the principle of alienation, while at the same time leading to a new art form with its transformation of an activity into another medium. In fact, the seven photographs making up Flour Arrangements, little spectacular at first sight, are nothing less than a sensation. 1 Dimensions of photos 1–7: 12 3/16 ✕ 23 ¼ in. / 10 ✕ 23 13/16 in. / 19 3/16 ✕ 22 11/16 in. / 13 3/16 ✕ 23 ⅞ in. / 19 ⅛ ✕ 23 ⅝ in. / 17 ¾ ✕ 23 ¼ in. / 11 ⅛ ✕ 23 7/16 in. 2 Willoughby Sharp, Nauman Interview, 1970, in: Arts Magazine 44, no. 5, March 1970; quoted in: Janet Kraynak, ed., Please Pay Attention Please: Bruce Nauman’s Words. Writings and Interviews, Cambridge, MIT Press, 2005, p. 118. 3 See Constance M. Lewallen, ed., A Rose Has No Teeth. Bruce Nauman in the 1960s, Berkeley, University of California Press, 2007, p. 79f. The catalogue accompanied the exhibition of the same name organised by the University of California and the Berkeley Art Museum and Pacific Film Archive (17.1. 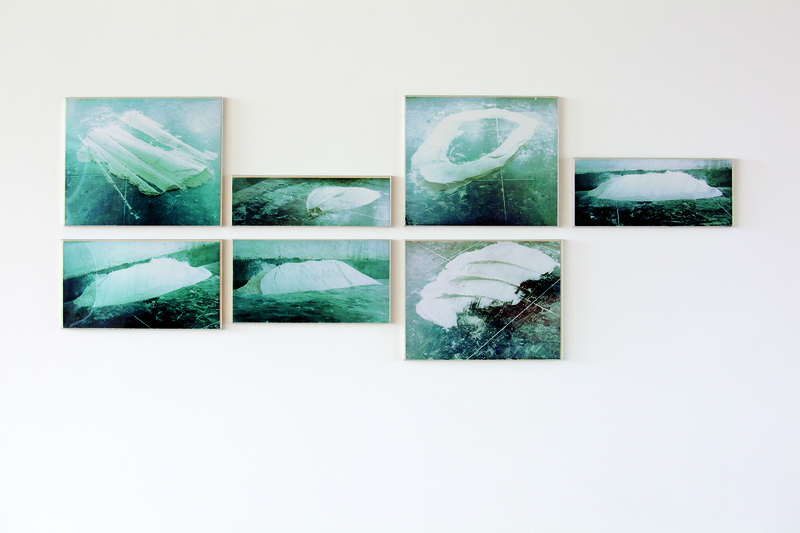 – 15.4.2007), and subsequently shown at the Castello di Rivoli Museo d’Arte Contemporanea, Turin (23.5. – 9.9.2007) and The Menil Collection, Houston, Texas (12.10.2007 – 13.1.2008). 4 Lewallen 2007, p. 197. 5 Benjamin H. D. Buchloh, Process Sculpture and Film in Richard Serra’s Work, 1978; in: id., ed., Neo-Avantgarde and Culture Industry: Essays on European and American Art from 1955–1975, Cambridge, The MIT Press, 2000, p. 414. 6 Nauman has treated the image of the artist as fountain in photographs and drawings as well as in his rose coloured Window or Wall Shade, 1966. In the black-and-white photograph Self-portrait as a Fountain, 1966/67, for example, the artist depicts himself spewing an arc of water out of his mouth. With the words The True Artist is an Amazing Luminous Fountain, he made mysterious statements on the nature of the artist. At the same time, the notion of the fountain suggests a link with the urinal that Marcel Duchamp submitted, as an artwork under the title Fountain, to the 1917 annual exhibition of the Society of Independent Artists in New York, and which was rejected by the jury amidst much uproar. 7 Sharp 1970, p. 20. 8 Joe Raffaele and Elizabeth Baker, The Way-Out West. Interviews with 4 San Francisco Artists, in: Art News 66, no. 4, Summer 1967, p. 40. 9 Jan Butterfield, Bruce Nauman: The Center of Yourself, in: Arts Magazine 49, no. 6, February 1975; quoted in: Neil Benezra, Surveying Nauman, in: Joan Simon, ed., Bruce Nauman, exhibition catalogue and catalogue raisonné, Minneapolis, Walker Art Center, 1994, p. 22. 10 Unlike with painting, Nauman has always maintained a relationship with drawing. He has used it to develop ideas, note down instructions for the manufacture or installation of his works or think through new projects. 12 In the catalogue raisonné appended to the catalogue of the 1994/95 touring exhibition Bruce Nauman, organised by the Walker Art Center in Minneapolis, author and co-editor Joan Simon cites the term soft shape in the case of various works that are all listed as Untitled, 1965. See e.g. no. 7, p. 192; no. 9, p. 193; no. 15, p. 194. 13 Land art, for example, arose out of actions in and with nature, Body art out of working with the artist’s own body, etc. 14 In one of Nauman’s early films, Thighing of 1967 (16 mm color film with sound), for some 10 minutes Nauman squeezes his thigh with his hands while sighing – another example of wordplay translated into a visual image. 15 Bruce Nauman in an interview with Lorraine Sciarra, January 1972; quoted in: Kraynak 2005, p. 157. 16 Sharp 1970, p. 34. 18 In pictures taken by the photographer Jack Fulton, the “California Grocery” store sign can still be seen over the entrance. 19 Ian Wallace and Russell Keziere, Bruce Nauman Interviewed, in: Vanguard 8, no. 1, February 1979, p. 18. 20 Joan Simon, Breaking the Silence. An Interview with Bruce Nauman, Art in America 76, no. 9, September 1988, p. 143. 21 On the motif of Fountains, see note 6. In 1970 the original print of Self-Portrait as a Fountain (1966), along with other photos from the series Untitled (Set of Eleven Color Photographs), was destroyed by flooding at the Leo Castelli Gallery, New York. That same year the gallery reprinted the series as a portfolio titled Eleven Color Photographs in an edition of eight. 22 Janet Kraynak, Bruce Nauman’s Words, in: Kraynak 2005, p. 13. 23 The first of these films was Sleep (1963), which shows the Beat poet John Giorno sleeping for a good four hours. Like many other artists at this time, Nauman was impressed by Warhol’s use of the camera. 24 A standard reel measures 400 ft (122 m). The running time of a 16 mm film with 24 frames a second is about 11 minutes. 25 Composite Photo of Two Messes on the Studio Floor, 1967, gelatin silver print, 40 1/2 x 123 in. (102.9 x 312.4 cm). Collection The Museum of Modern Art, New York; Gift of Philip Johnson. Simon 1994, cat. rais. 75, p. 210. The photo collage can be seen, for instance, on a wall in Nauman’s studio in Shelby Kennedy’s movie The Bruce Nauman Story (1968). 26 In an interview with Kathy Halbreich in January 2012, Nauman describes the motifs in the pictures thus: “That’s the results of a couple of different projects, the litter of a couple of different projects.” The Museum of Modern Art Oral History Program, 9 January 2012. Joan Simon writes of this work in the catalogue raisonné: “This rephotographed montage, whose viewpoint was inspired by early satellite images transmitted to earth, is related to [cat. rais. no.] 42, a photographic piece that documented Nauman‘s meticulous shaping of piles of flour with a two by four into gestural, swept forms. Composite Photo of Two Messes […] shows the detritus of that work and other sculptural projects as well.” Simon 1994, cat. rais. 75, p. 210. 28 Lewallen describes the film Untitled (Flour Arrangements) that was made on 22 October 1967 at the instigation of William Allan, “an artist-in-residence with the Experimental Television Project funded by the Rockefeller Foundation at KQED, the Bay Area’s educational TV channel.” Lewallen 2007, p. 80. 30 The picture in question is reproduced e.g. in Peter Plagens, Bruce Nauman: The True Artist, London, Phaidon, 2014, fig. 44, p. 53. 31 Coosje van Bruggen, Bruce Nauman, New York, Rizzoli International Publications, 1988, p. 226. 32 Simon 1994, cat. rais. 42, p. 202. 33 Lewallen 2007, p. 63. 35 Bruce Nauman, Work from 1965 to 1972, organised by the Los Angeles County Museum of Art (19.12.1972 – 18.2.1973) and the Whitney Museum of American Art, New York (29.3 – 13.5.1973). The exhibition subsequently toured to Kunsthalle Bern; Städtische Kunsthalle Düsseldorf; Stedelijk van Abbemuseum, Eindhoven; Palazzo Reale, Milan; Contemporary Arts Museum, Houston; San Francisco Museum of Art (1973 – 74). Exhibition catalogue edited by Jane Livingston and Marcia Tucker, Los Angeles, Los Angeles Museum of Contemporary Art, 1972. 36 Juliet Myers (as note 29) states in her email: “The sequence for hanging Flour Arrangements is to be consistent with the 1973 catalogue, just as Urs [Raussmüller] had them installed at the Hallen für Neue Kunst in Schaffhausen for 30 years.” Cf. fig. 20 in the exhibition catalogue Livingston/Tucker 1973. In the majority of books and catalogues on Nauman published since 1984, including the catalogue raisonné of 1994, Flour Arrangements is illustrated by a photograph of Raussmüller’s 1984 – 2014 installation. 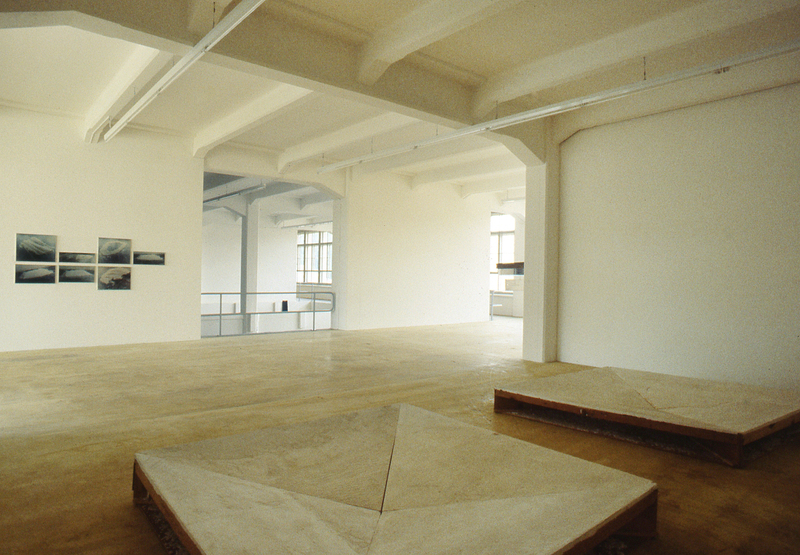 37 Museum Haus Lange, Krefeld, Kounellis, Merz, Nauman, Serra; Arbeiten um 1968, 15.3. – 26.4.1981; reproduced on p. 28 of the exhibition catalogue. 39 Soft and Apparently Soft Sculpture, touring exhibition organised by Lucy R. Lippard for the American Federation of Arts, 1968/69. 41 Musée d’Art moderne de la Ville de Paris, Paris, Pandora’s Box. Jan Dibbets on Another Photography, 25.3. – 17.7.2016; reproduced on pp. 140/141 of the exhibition catalogue. 42 Schirn Kunsthalle, Frankfurt a. M., Giacometti – Nauman, 28.10.2016 – 22.1.2017; reproduced on pp. 116/117 of the exhibition catalogue.